This is a rural hotel, which means it has restricted service hours. You are on your own most of the time. Breakfast is normal Spanish, exceptional local preserves. If you ask, you get good coffee. Rooms are small, bath room fine - area is quiet and near by is the village center, restaurants. Popular with people who want to hike in the terraced landscapes and mountains nearby. Good place to stay and then visit. Very nice owners who take care of you. Lovely village, nice little B&B. Very quite on Sundays only one restaurant open and a couple bars,otherwise all good rooms are clean,continental breakfast was good. Wifi was a bit hit and miss in our room, but fine in bar dining area..
Hostess/Manager is exceptionally kind, caring, attentive. Our room was spacious, clean, elegant. The bed was comfortable. Breakfast was generous and delicious. The hotel is small (that's good! ), with a serene, inner courtyard. The town is the loveliest on La Gomera. This is one of the most beautiful towns in the Canaries. Walking through Agulo feels like a walk back in time. In one direction, banana groves and vegetable patches cascade steeply towards the cliff-lined sea. In the other direction, the town rises in a tangle of steep streets and paths toward the base of the high cliffs overlooking the town. 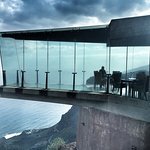 The spectacular Mirador de Abrante sits atop one of these cliffs overlooking the town, 200 m below. It's a 15 minute drive up there from town, through some scenic, and vertigo-inducing roads. Definitely worth the effort. We arrived in town during Epiphany, so the main restaurant was closed, but El Mantillo was open. We really enjoyed the charm and charisma of the waitress there. And the rustic Canarian fare wasn't bad either. We stayed here for one night when we were visiting La Gomera. Charming place, only complaint very hard beds. The rooms are clean and the village is adorable and very quiet. Parking can be found in the vicinity of the hotel.